The 100 rep challenge is a very basic concept, but it opens up a big spectrum of possibilities. The idea was started by a trainer from Scotland named Rannoch Donald and it’s now growing into a worldwide trend. The challenge is simple; take any exercise (or exercises) and do 100 total reps. Your objective is to do the workout as quickly as possible. Keep in mind, however, that good form should always come first. Do not sacrifice good from in order to get through it quickly – every rep is important! If this version of the 100 rep challenge is too advanced for you, check out the 100 rep challenge official website for other quick, simple and effective workouts. A 100 rep challenge E-book is also in the works (more info to come soon). In the meantime, check out this video of me attempting the whirlwind. If anyone reading this is bold enough to try The Whirlwind, let me know how it goes! i like it , like thins kind of circuit training ! Cool! Can't wait to see your video, Vassili! Great stuff but I will have to try and do it scaled down. I'm almost there tho! Thanks, JP! For people who can't do muscle-ups just substitute an extra 10 pullups. Also anyone who can't do 10 pistol squats can sub jump squats. I absolutely love this – great challenge. I don't think I could come close – maybe if I cut the reps in half and did it twice and subbed pull ups for muscle ups and chin ups for pull ups. Also I can do good pistols with my left but struggle to do more than 1 on my right leg. Do you think I should do box pistols with the right? Anyway I going to try next week after a few days off gtg. I hope to one day be able to match this effort. Also congrats on your multiple one arm pull ups – an awesome display of persistence and focus – brilliant! As for the one arm pull-up, like you said it takes a lot of practice and persistence, but it is attainable! Just came across your site recently. That’s why I’m commenting an older post. I’ve been doing my own 100 rep workout, which is not as hard as yours but leaves me gasping for breath regularly (despite all the years of long distance running):-15 dips-10 pull-ups-10 pistol squats right -10 pistol squats left-15 push-ups-20 hanging leg raises-20 single leg deadlifts (alternate)Now, that I’ve found your site, I’ll try to incorporate other exercises I didn’t know before (e.g. 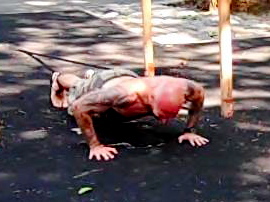 the pike push-up, l-hangs & others). I’ll try to get your book [which might be a little difficult down here], but I guess it’s more specific on the pull-up, isn’t it? Thanks, Al, for this sweet collection of painful exercises. Hooray for the strong man! Cheers from Mexico! Thanks for the message, Marcelo! Your 100 rep workout sounds pretty serious – We’re Working Out!